I hope everyone enjoyed the long 3-day holiday weekend. The weather was beautiful and marked the end of summer, but a welcome of cool, fall evenings. I enjoyed reading by the pool and on the balcony, dinner and outdoor drinks with friends, and baking the last of summer’s fruit before fall hits full force with football Sundays, chili, pumpkins, apple crisp, and turkey. This week’s posts will all be an ode to summer with some of my favorite seasonal recipes I’ve made over the last few weeks. You still have a few weeks to enjoy them, too! When I found today’s recipe for peach shortbread over at Smitten Kitchen last week (you have to check out her pictures, they are so lovely! ), I just knew I had to make it immediately. I often find recipes I want to try and they sit in my queue for weeks or months. If you check out the pictures of the peach shortbread over at Smitten Kitchen, you will notice the beautiful yellow and red colors from the peaches. Yellow peaches have higher natural acidity, so while they’re sweet, you also have a tangy taste with each bite. 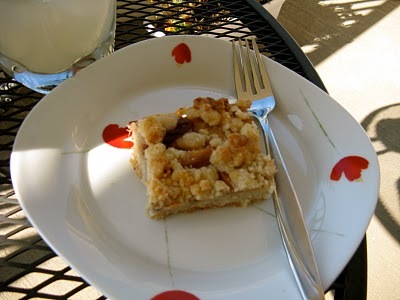 When I went on my hunt for peaches, I found beautiful, large white peaches for my shortbread. White peaches are lower in acidity. You’ll taste no tartness, only a floral sweetness. I thought this was perfect for such a sweet dessert. I also added water to the recipe based on the comments from the original recipe. When you “brown” butter, it evaporates the water. Adding water back into the recipe helps make the shortbread more moist. First begin by browning your butter. The extra time spent browning the butter is definitely worth it and adds a nutty flavor to the shortbread (my taste-tester even agreed the butter made this recipe complete). To brown butter, melt butter in a small or medium saucepan over medium-low heat. It will melt, then foam, then turn clear golden and finally start to turn brown and smell nutty (this took approximately 30 minutes). Stir frequently, scraping up any bits from the bottom as you do. As it begins to brown, you will see brown particles at the bottom of the saucepan. Keep your eyes on it; it burns very quickly after it browns and the very second that you turn around to do something else. Set it in the freezer until solid (about 30 minutes). Preheat the oven to 375 degrees. Spray a 9×13 inch pan with a non-stick spray. In a medium bowl, stir together sugar, baking powder, flour, salt, cinnamon and nutmeg with a whisk. Using a fork or your fingertips, blend the solidified brown butter, egg and water into the flour mixture. It will be crumbly. Pat 3/4 of the crumbs into the bottom of the prepared pan, pressing firmly to create a crust. 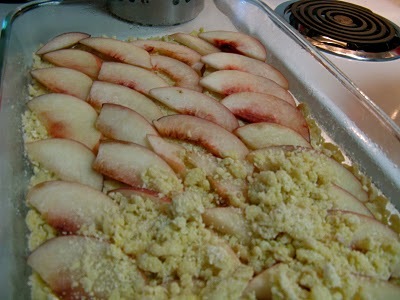 Layer the peach slices over crumb base. Scatter remaining crumbs evenly over peaches. Bake for 30 minutes, until top is slightly brown and you can see a little color around the edges. Cool completely in pan before cutting into squares.